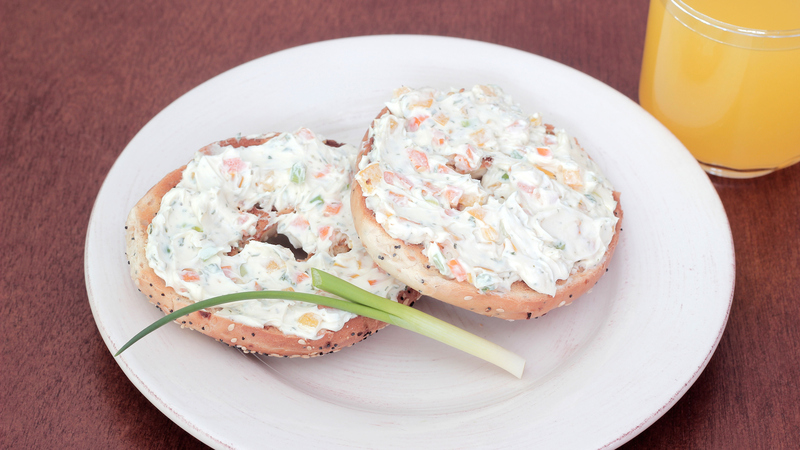 Everyone loves a good bagel spread for most occasions, but especially to break the fast at the end of Yom Kippur. I love putting together a platter of thinly sliced red onions, capers, cucumbers and tomatoes to top my glorious bagel. But what if you want to do something a little different for your break-fast!? How about making some custom cream cheese flavors! I am partial to savory cream cheese flavors such as this Herbed Cream Cheese from Tyler Florence or this Vegetable Cream Cheese from Ina Garten. But you could also go a sweeter route with this Cinnamon Raisin and Toasted Nut Cream Cheese. You can even add a few teaspoons of your favorite jam for a fruity cream cheese spread. Top with fresh fruit for a complete sweet bagel treat! Or you can go a little wild and try my recipe for Chipotle Cream Cheese. Feel free to add more or less chipotle depending on your tastes. In a mixing bowl, combine minced chipotle and liquid, salt, pepper and garlic powder. Add softened cream cheese and mix until combined thoroughly. Serve with fresh bagels and sliced avocado.